Using Espresso Parts 15" x 7" Rinser with Side Spray, pitcher rinsing can become better integrated into the cycle of latte creation. Rather than leaving time to step away from the counter to wash out each used milk pitcher, the Espresso Parts rinser allows baristas access to assembly-line style cleaning: Rinse, Drain, Reuse. Baristas will never run out of pitchers when they're able to clean as they go. Espresso Parts has improved on their basic rinser design by increasing water pressure, and using non-slip ridges over a larger diameter rinser-star so that the busy task of cleaning milk pitchers can be completed more efficiently. 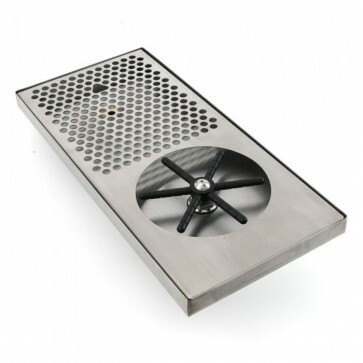 Installs directly into countertop - This rinser does require a counter cut, however its space saving design will save you the hassle of balancing (pitcher over rinser over counter!). Increased water pressure - They've upped the pressure on this model so that you can spend less time cleaning and more time frothing. Larger diameter star with non-slip ridges - The rinsing stars' increased diameter means you can clean larger pitchers, and its non-slip ridges will allow you to multi-task as you rinse.